Salad has always been popular in summer, but is now a growing trend as well. In late April, Dutch supermarket chain Albert Heijn gave the segment another boost with the introduction of more than 30 innovations. “Salads have developed from sidekicks into superheroes. 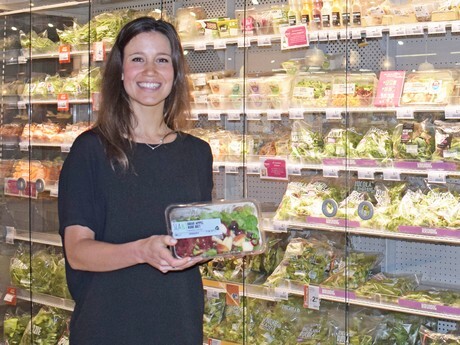 They’re an increasingly more important part of the menu,” says Cristina Calceanu, manager vegetable convenience for Albert Heijn. She looks specifically at customers looking for convenience, the washed and cut product has to be ready to cook or ready to eat. She went all out with salad innovations. These vary from easy introductions to introductions that required quite a bit of brainwork and market research in advance. 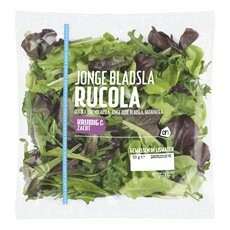 AH managed to create a clear salad world on their cooled shelves by bringing their salads down to four easy steps. This can be seen very well at AH XL in Zaandam. The world of salads is located behind the double doors of the cooled shelves, and consists of three flavour segments. The various flavours of lettuce have been indicated by means of colours: blue for fresh, yellow for mild and purple for spicy. A bright pink card explains in four steps how to create the best salads, to help consumers choose and combine. The innovations are about flavour and colour. “We want to bring life to the ‘green wall’ with colour, and trigger consumers to be creative with the various colourful, pre-cut vegetable combinations. Colours that really stand out are the dressings based on fruit or vegetables. These mostly contain ingredients that can also be found in kitchens. The recipe for the dressing is very recognisable. Consumers could actually have made these themselves as well.” The shelves have also become more colourful because of the raw vegetable salads, combinations of fruit and vegetables, with the dressing added in a separate compartment. 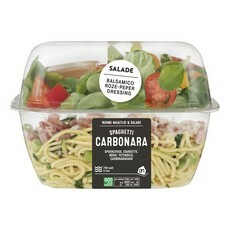 To arrive at the new world of salads, market research into the wishes of consumers and their preferences has been done. The online Allerhande recipe search engine is another important source of information for Cristina, because this clearly shows what consumers are looking for. The introduction of the world of salads has been supported by the Allerhande magazine. In the past month, salad was singled out in the magazine, and consumers were introduced to the new steps for creating a perfect meal salad.